Travel Journal Ideas – Why Write When You Can Have a Travel Story-Map? When I shared one of my travel journal ideas of a Story-Map Journal I’d kept last year in Europe, there was a buzz of excitement and interest. 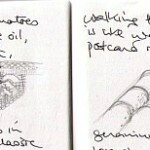 Certainly, for me, it’s been the most successful travel journal I’ve ever kept. A mere glance at any page brings my travel memories vividly, and instantly, back to life without having to wade through pages of words – which being a visual person, is bliss! Such as the page, illustrated above, of a day in north Wales, when we drove down the coast, crossing a stone bridge, to the local auction room where we negotiated to swap a basket full of collectible wares, we’d taken with us to sell, for a very fine antique glass. 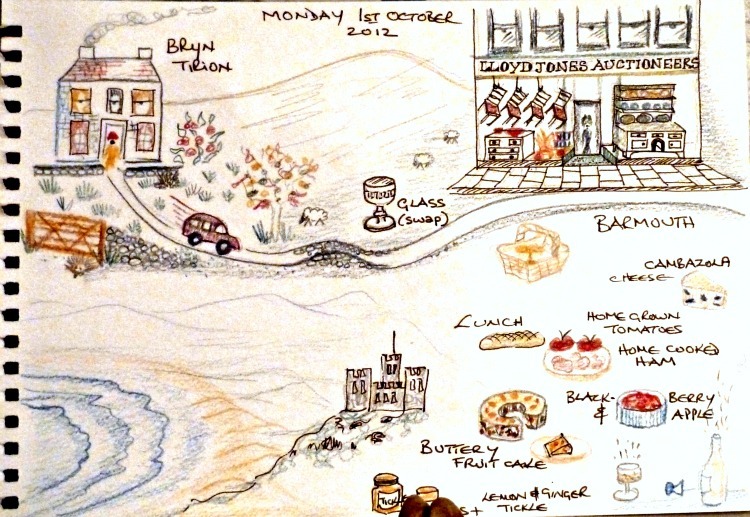 Driving back around the long sandy bay via Harlech’s thirteenth century castle we had a lunch of freshly bought bread, home cured ham and home grown tomatoes, followed by some apple with blackberries we’d gathered from the hedgerow. And at tea went on to enjoy a home baked buttery fruit cake and scones with lemon and ginger tickle. Those little visual clues can’t fail to get my mouth watering again! So… to dispel this myth I thought I’d do a tutorial on where to start with doodle drawings… and if at the end you realize it’s within your capabilities… I’ll write another post to show you more! Can you draw a wavy line? Or like below, go mad and draw three wavy lines? I’d now like you to draw another row of three wavy lines. And then, with the same fluid stroke, place the pen (or pencil) to the left or right of one of these waves and replicate the line crossing over (at some point) to land a little to the left or right at the opposite end. You’ve now created a road to illustrate your travels between any two places. A to B, or B to C! 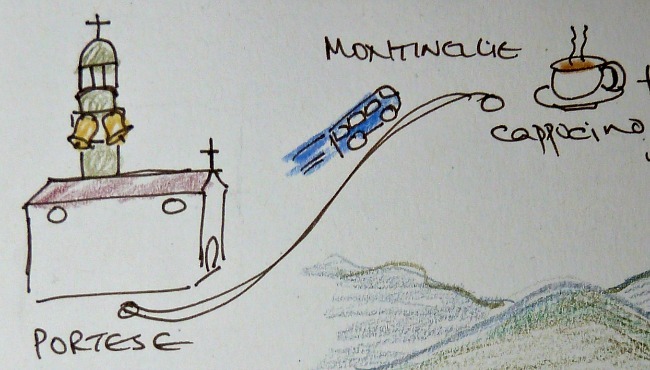 Below are a couple of examples from my Story-Map travel journal where I’ve used this simple doodle drawing technique to show, rather than tell, my travelling between two places. Or in the case above, without the need for verbose explanations, it can simply be seen that Salo is situated on the edge of Lake Garda, where aperativos can be enjoyed out in the sun on the foreshore. So, with the road down pat, we need to add the means of transportation. Put some tyres on the wheels, a pin head man in the front windscreen and to create a sense of movement draw a line from the roof off out to the back. Repeat, stopping each line a little shorter than the one above it. So maybe next time you’re going on a trip, you might consider this travel journal idea for portraying visually how you set off on your holiday adventure? So, did you manage a couple of wavy lines? 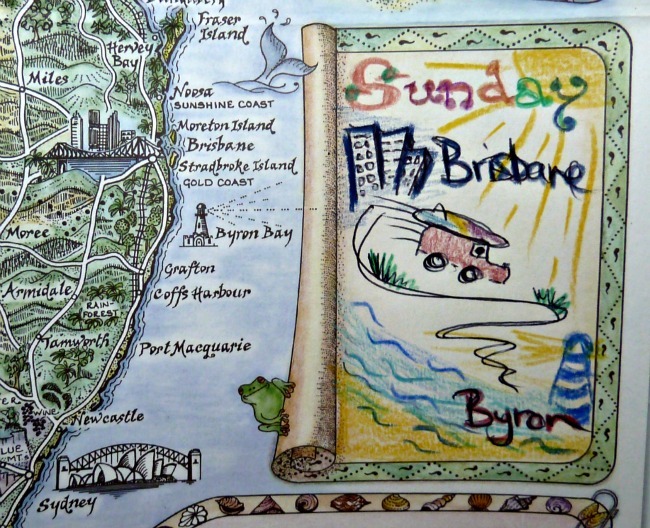 This entry was posted in Creating Story Maps, Travel Memories and tagged doodle, holidays, travel_journal, travel_memories by Linda. Bookmark the permalink. You are too clever Linda, but I think the key to your unique style is what you wrote at the top of the blog, “without having to wade through pages of words”. I am not an arty person but I adore words and am enjoying writing my blog posts from the very wordy diaries I kept whilst overseas, with some help from photos, etc. 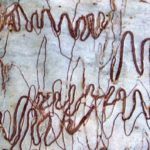 I could probably draw the wavy lines and cars as you suggest but they would be nowhere near as stylish, and they are what make you and your blog so individual, (not to mention your business). I do love receiving your blog – keep up the good work. I even wrote a post:- Are you an Aural, Visual or Kinaesthetic Person? Amusingly, just the other day, I heard a copywriter describe herself as being “graphically challenged”! To me, a little illustration acts like punctuation – It gives me a breather and helps to make the words make sense. Absolutely gorgeous, Linda. I loved your tutorial but sadly I failed big time! I’m much happier watching you and marvelling at your talent. I’m after collaborators here who’ll take the leap of faith and jump in with me! I can feel a trip to the East coming on, and a workshop is required 😉 How I wish I had your talent for expression via words, symbols and pictures. I’m hoping to make it to the blogging conference on the Gold Coast in Sept so maybe catch up there? Thanks so much for sharing these ideas. 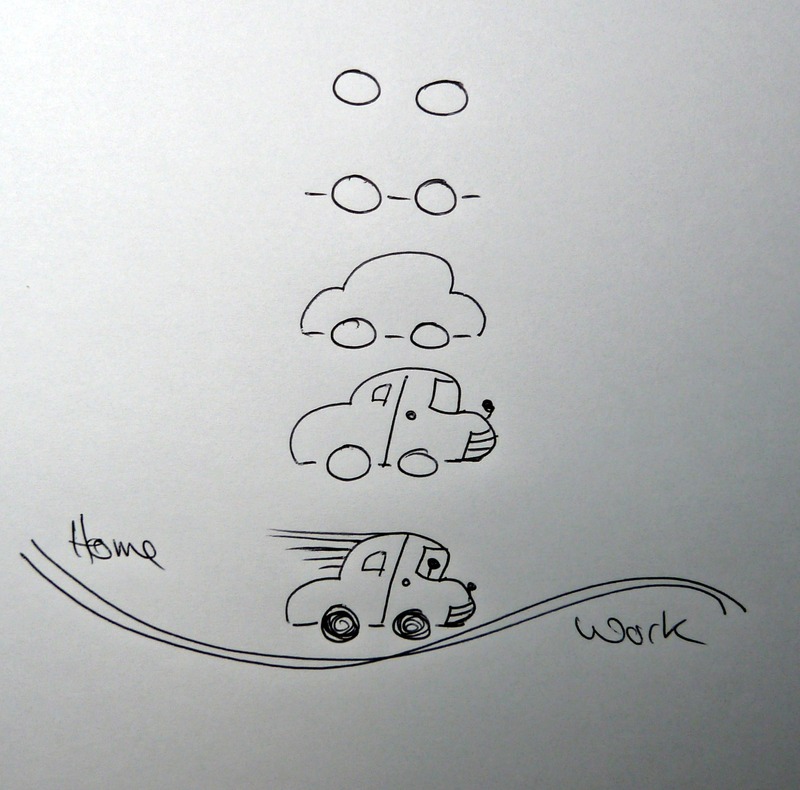 I could draw the simple car before but it is the lines and other features that make the difference. It gives it movement and interest. I have set a goal to do more little pictures as part of my journaling. Thanks for the inspiration. So pleased you’ve seen just how easy it is to add that bit of movement…. Great idea! Going back and looking at these once the holiday is but a distant memory will be very rewarding. I’m going to give it a go on my holiday to Japan in June. The buildings might be difficult to sketch though! I might have to do a post for how to draw the gist of a building! Love it! I tried to keep a journal like that while walking the Camino de Santiago, but failed miserably! Looks like you are using coloured pencils as opposed to crayons…that may have been my first mistake! Will have to try again – find taking a few minutes to journal after a great day so fun and love going back over it weeks or years later! When you’ve experienced the fun and joy of “going back over it weeks or years later” the effort of creating some form of travel record via note-taking or doodling more than rewards the effort! This is exactly what I have been looking for. I know I am a bout a year late, but are there other posts on this topic? Amazing Linda.There is so much to learn from you. love your posts.So beautifully illustrated.